Yesterday we entered the Drake Passage and the seas were so rough that many had to retire to their cabins to avoid sea sickness. 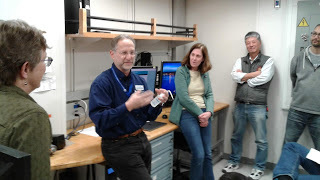 Today conditions are much better and the sedimentology team, that I am part of, invited a well-known Antarctic paleontologist, Reed Scherer, to explain the correct process of making smear slides. And: Reed revealed his dirty little secret, which involved a potato and some ballet movements. So what is a smear slide? A smearslide is a smear of sand and mud from the drillcore on a glass slide, so that it can be viewed under a microscope. The sedimentology team uses smear slide observations to characterize microfossils and minerals in the sea floor sediments. The fossils tell us something about the living conditions in the ocean around Antarctica thousands to millions of years ago. The minerals would tell us something about the rocks on Antarctica the glaciers were eroding, because rocks are made of different minerals. More about that later. 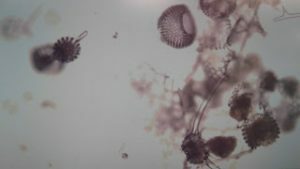 The image shows an example of microfossils of a group called Radiolaria, a kind of zooplankton. So how to make the perfect smearslide? Well, the sediment needs to stick to the slide. Water doesn’t work, because it creates a droplet, so you can either lick the slide, or…… use a potato! The potato is very important. First of all, it needs to be clean, so no microfossils or dirt sticking to it. Second, you need to take care of your potato: wrap it in foil after use and store it in a refrigerator (I think we may get only one potato for the entire expedition?). The potato is used by rubbing your finger over a cut face so that starchy liquid can be transferred to a thin glass cover slip. This is then where the mud will stick. Then, the cover slip with mud is left on a hot plate to dry after which the glass slide is put on top of the cover slip. This involves a special type of coordinated movement: closing the two glass slides on top of each other like the jaws of an alligator, while bending the knees. Reeds says it doesn’t work if you do not bend the knees, so that is also very important. We have all been practicing bending our knees and we hope to be experts by the time the first core gets on deck!